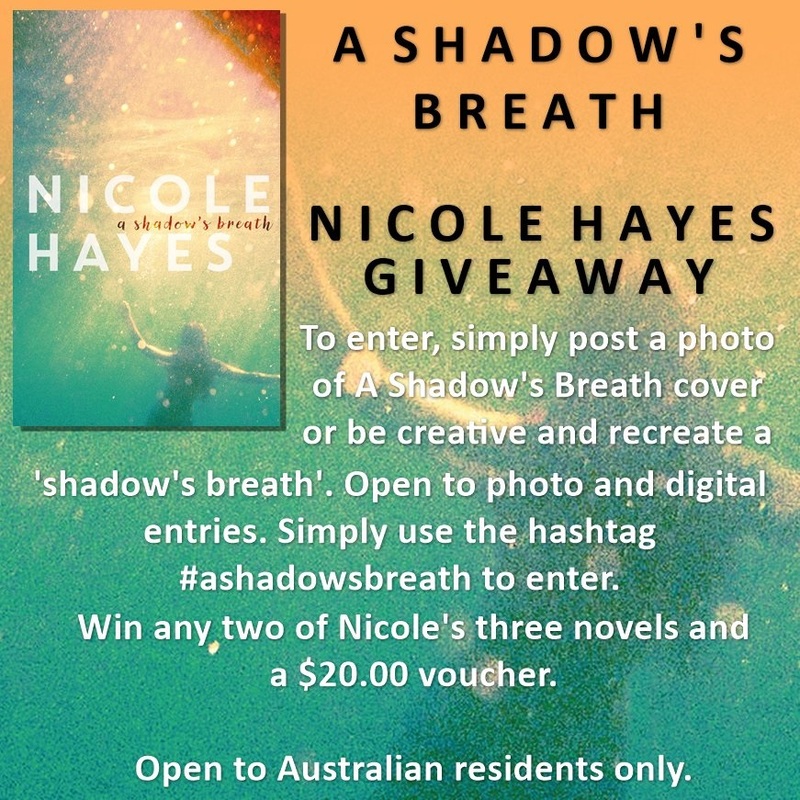 To celebrate A Shadow’s Breath, I’m giving away a choice of two of my titles and a $20.00AU gift voucher. To win, simply head over to Eugenia’s Instagram page for more details. Entries via Twitter or Instagram. Need some help with your manuscript? Over the years I’ve mentored and worked with a range of different writers at different stages of their writing careers, but there have been too many times I’ve had to say no. This year, I’ve rearranged some of my commitments so that I can focus more time on mentoring and editorial feedback, so if you’re an aspiring or emerging writer looking for some advice or feedback on your manuscript, shoot me a message so we can talk about strategies and options. Let’s see if I can help you get it over the line. Contact me on Twitter @nichmelbourne or Nicole Hayes (author) on Facebook. 2017 has been a massive year so far with two books published in February, and deadlines and events building up. So many lovely reviews for A Shadow’s Breath — like this, this and this — and the list of appearances and events for later in the year is keeping me on my toes. You can check out my Facebook page for specifics once they’re announced. Alicia Sometimes and I have been so chuffed with the love shown by kids, teachers, and footy fans alike for A Footy Girl’s Guide to the Stars of 2017, which has been flying off the shelves. Seeing our “Stars” – Erin Phillips, Daisy Pearce, Emma King, Darcy Vescio, Katie Brennan, Maddy Collier, Kara Donnellan, and Sabrina Frederick-Traub – blitzing in the amazing AFLW has been a highlight and a thrill. Incredible to see Erin Phillips take out MVP and the premiership cup, and delighted that all our players have been re-signed by their teams for 2018. They all had standout moments in different ways, on and off the field, and each of these players carved her mark in her team’s success, as well as for women’s footy, and women, more broadly. Being a part of all this with the Outer Sanctum has been icing on the cake. Also delighted to receive some unexpected acknowledgement for my second novel – the gift that keeps on giving, One True Thing — which was shortlisted for the WA Premier’s Literary Award and is currently on the shortlist for the WA Young Readers Award, the Young Australians Best Book Award (YABBA), and the KOALA awards — results of all three to be announced later in the year. While it’s a privilege and an honour to be recognised by adults, teachers, librarians, booksellers, and of course, readers generally, the whole reason I love to tell these stories is to connect with young people in particular, so these latest acknowledgements mean the most to me as they’re voted by young people themselves. Lovely to see One True Thing alongside The Whole of My World in being recognised in this way. Finally, the Outer Sanctum is now part of the ABC platform which has been a huge change for us, and a good one. We’re still finding our way around the studio, but having the support and the space at Southbank has been a dream. You can stay in touch the goings on here. For information about classes, events and appearances, you can check my Facebook page, and follow me on Twitter: @nichmelbourne or Instagram: nicolehayes9706. 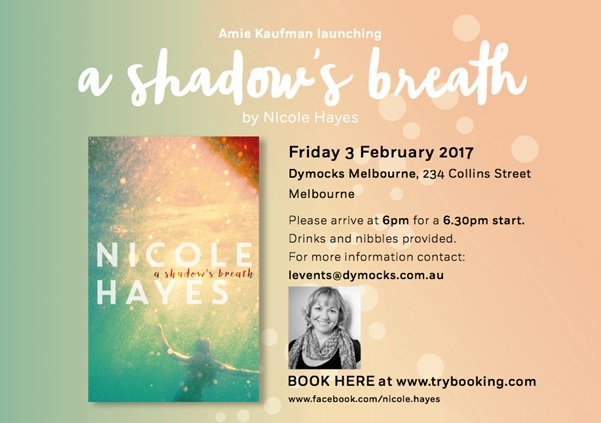 Excited to announce that A Shadow’s Breath, my new YA novel, will be launched on Friday February 3, at Dymocks, Collins Street, Melbourne by the amazing New York Times bestselling author, Amie Kaufman. Even better, the reviews are coming in, and they’re lovely. But if you can’t wait until Feb 3, or can’t make it to the launch, A Shadow’s Breath will be in bookshops January 30. You can pre-order now. 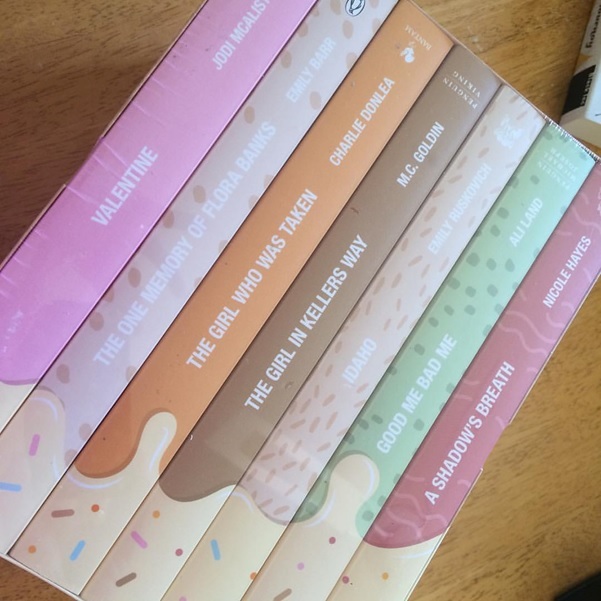 In the meantime, you might try to get your hands on one of these amazing review copies designed by the brilliant peeps at Penguin Random House. This beauty arrived on my doorstep just before Christmas. 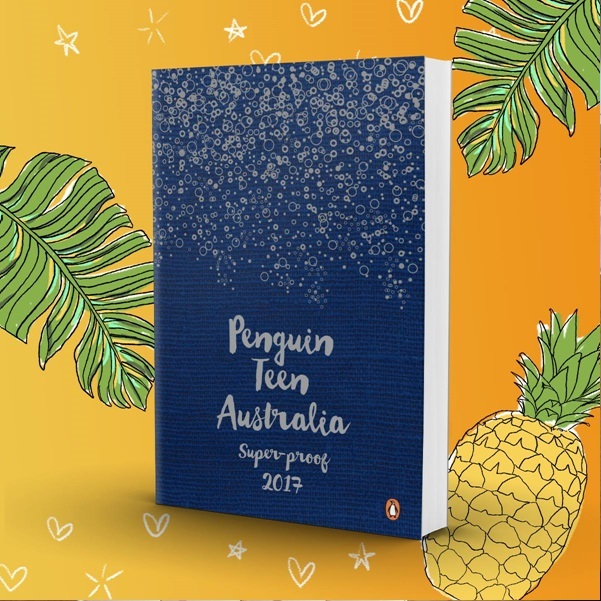 And if you can find your way to the Penguin YA Showcases, currently scheduled for Sydney and Melbourne, with whispers of others in the wings, you might be the lucky recipient of one of Penguin Teen’s famous Super-proofs – featuring extracts from a range of 2017 titles, including A Shadow’s Breath. You can check at your local bookshop, too, though they’ll be snapped up quickly, and numbers are limited. Also, keep an eye out for a series of public events to follow. If you love your footy, and are pumped about the launch of the inaugural women’s footy competition on Feb 3, you’ll want to get your hands on the other big project I’ve been working on this past year. 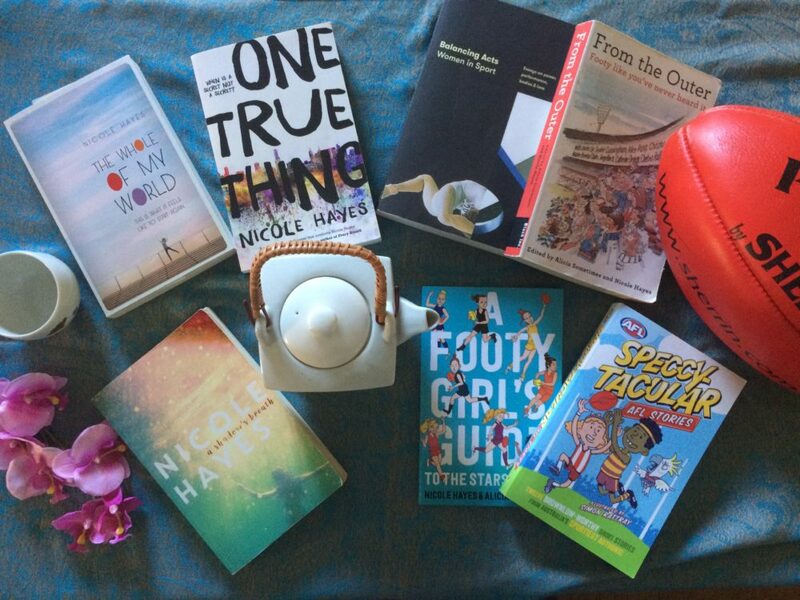 In collaboration with the amazing Alicia Sometimes, partner in crime at the Outer Sanctum, and collaborator on our 2016 book, From the Outer: Footy Like You’ve Never Heard It, I’m excited to announce the upcoming must-have guide to the women’s competition: A Footy Girl’s Guide to the Stars of 2017. 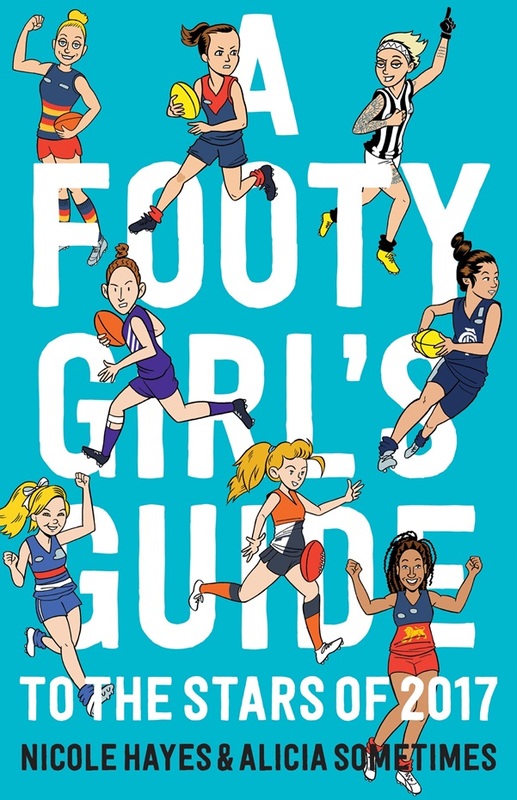 Aimed at kids ages 7-12, A Footy Girl’s Guide features one superstar from each of the AFLW clubs, including Daisy Pearce, Katie Brennan, Sabrina Frederick-Traub, among others. 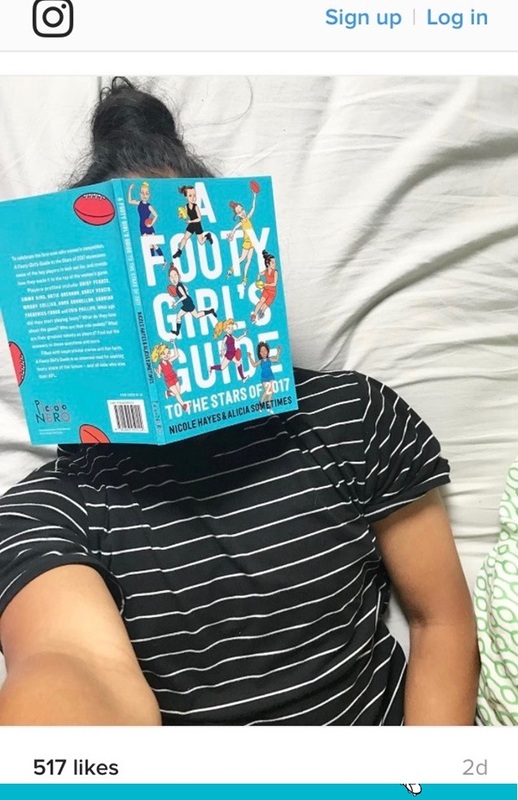 Available February 1, or on pre-order now, A Footy Girl’s Guide is the must-have book for footy fans young and old. Okay, it was me. Still, we at the Outer Sanctum have been busy preparing for this groundbreaking event, gearing up to share with you the stories that matter to us, on and off the footy field. Can’t say much yet, so stay tuned for more in late January. LIKE 2017 WASN’T BUSY ENOUGH! Here are a whole bunch of books you should read. One of them might or might not be mine. The talented Eliza Graham, author of Playing with the Moon, Restitution, Jubilee, The History Room and The One I Was, as well as young adult novel, Blitz Kid has asked me to take the baton for a Blog Hop, called The Writing Process. As with these things, there are four questions which I’ll do my best not to fudge too shamefully. Or maybe I’ll use a pretty colour when I do. You caught me at a great time. I’ve just finished my next novel – no spoilers yet, I’m sorry – and have embarked upon the gratifying but also mildly terrifying task of trying to adapt my debut novel, The Whole of My World, for screen. Some days brilliantly. Others not so much. Generally I have to hide in a local cafe for a few hours, wifi-free, and knock out some pages before I feel confident enough that I won’t spend the rest of the day playing Words with Friends or trying to get Ricky Gervais to retweet me. (@nichmelbourne, Ricky, if you’re interested.) After that, I tend to library shop until I can find one with a good power source but without Story Time for Toddlers happening concurrently. So that’s me. Next Monday, it’s the turn of the amazingly awesome Annie Collins – a fiction writer currently completing her degree in Publishing, Writing & Editing at RMIT (Melbourne), and winner of the Monash Literary Festival award. Check her out here www.ajcollins.com.au. Workshops January and February 2019 – and HAPPY NEW YEAR!!! MANUSCRIPT ASSESSMENTS AND FEEDBACK – NEW DATES! A Shadow’s Breath on TV! !